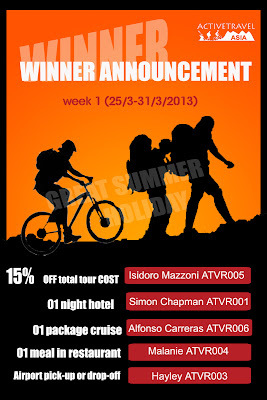 A huge congratulation to ACTIVETRAVEL ASIA‘s lucky travelers in summer promotion program 2013. 1. Discount up to 15% on the total cost. Please check the email if you are lucky winner. Join with our event “ https://www.facebook.com/events/125745387611125/” to receive lucky gifts for your jouney!